"Believe in the Lord Jesus, and you shall be saved!" This refrain is one of the most common evangelistic statements from Christians to non-Christians. While it may seem quite offensive to some people in a secular culture, it is far better than some who screamed out like a doomsday prophet: "Believe in Jesus or else you go to hell!" Thus, it is incorrect to say that we go to hell because of failing a decision making matrix at the Cross. People are on the way to damnation anyway. Christ just offers them a way out. By rejecting Jesus, they are preferring to walk their default ways. That is why we choose what we want to live. Some choose Christ. Others choose their own ways. No one forced them. This week, I like to look not about the decision for Christ, but what happens AFTER the decision. It does not mean the initial decision is unimportant. It simply means the first decision is simply triggering a journey of faith that needs to be completed in Christ. In his book, "After You Believe," NT Wright stated that our Christian living must be "understood and shaped in relation to the final goal for which we have been made and redeemed." Having said that, he argues that life after that decision for Christ must be reflected in character formation in Christ. This is what must happen after we believe. In many outreach events, Christians behave like gospel salesmen, feeding promises and salvation to anyone who would make a decision to believe in Jesus. The prosperity gospel group would trumpet material riches that grow proportionally with faith. Give more and you will receive double or triple, they say. Others proclaim a faith whereby if we fail to obey the do's and don'ts of the faith, we will be rewarded or punished accordingly. The hyper-grace party will pooh-pooh away every negativity with a generous dosage of grace and unmerited favours, to the point that it does not matter what we do after we believe, as grace is an umbrella large enough to shield believers from all things. People who choose to simply enter the narrow gate, only to ignore the other aspect to continue walking the narrow path, are people who are "salvation-skewed." They care only to possess the ticket to heaven, and then continue to bask in worldliness. They claim Jesus to be Lord, but they live as if they are the lords of their lives. They confess Jesus but refuse to obey the teachings of Jesus to forgive others. They think that their one decision is enough to guarantee their stairway to heaven. According to Matthew 7:13, there is a gate followed by a road, a way, or a path. Just like the Parable of the Sower where there are four different kinds of soil where only one is fruitful and desired of them all, we can also see four different scenarios in Matthew 7:13-14 of which the best is preferred and the worst is mentioned. The best is the "narrow gate" / "narrow way." The worst is the "wide gate" / "wide way." 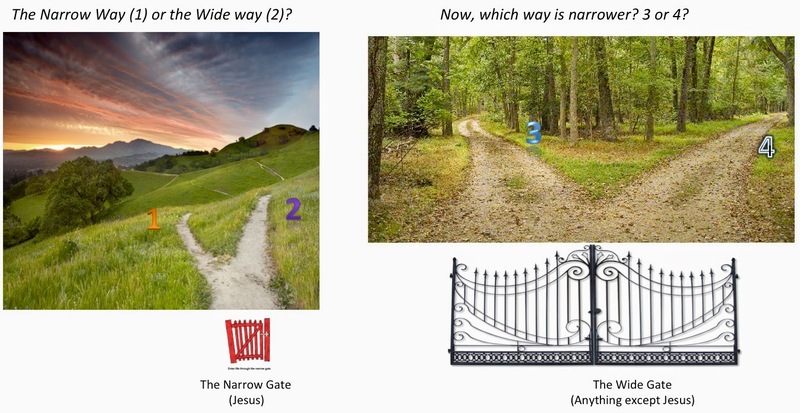 What about the "narrow gate" / "wide way" and the "wide gate" / "narrow way" scenarios? I present the four scenarios below. Obviously, Path #1 is the one Jesus would like us to choose. The rest of the paths do not lead to the end-goal that Jesus wants for us. Paths #2, #3, and #4 all lead to damnation. Jesus is clear. He says in Matthew 7:14: "But small is the gate and narrow the road that leads to life, and only a few find it." From my picture above, it is Path #1. Enter via the narrow gate (Jesus) and walk along the narrow way (Christlikeness). Path #2 is the path taken by those who are salvation-skewed but lifestyle-worldly. For there is no guarantee that those who enter by the narrow gate will continue to choose the narrow way. A salvation-skewed faith simply means that such people just believed in Jesus, and then live anyway they want. They are interested only in escaping death. They are not interested in embracing the life of Christ. They are merely investing in a heaven-ward promise without due regard for any desire for discipleship. They prefer to be guaranteed salvation and lived happily ever after on earth. Instead of living out the promises of God both in heaven and on earth, they confess with their lips but their hearts remain unchanged, untouched, and unconverted. Salvation-skewed people who take Path #2 are those who confess openly that Jesus is Lord on the outside, but on the inside, they remained unrepentant. They do not bear the fruit Jesus is looking for. They are those who hear something from Jesus but delays or never puts them into practice. They are happy to receive a ribbon that says they believe, but their actions do not reflect that of a disciple. For such people, Jesus says that they build their houses on sand. When the challenges of life hit and the trials approach, they are among the first to deny the faith, to flee toward the world, and to go back to what they feel most comfortable: Self-driven lifestyles instead of Christ-led growth. When I read the New Testament, I am reminded of certain people who began well but stumbled badly. I think of Judas Iscariot who was one of the original 12 disciples. Unfortunately, he chose the way of money and eventually betrayed Jesus. For one who had all the time and opportunity to observe and to learn from the Greatest Teacher who ever lived, it boggles me about why Judas Iscariot would have done what he did. Later in the New Testament, we read about Demas who deserted Paul after falling in love with the world (2 Timothy 4:10). Paul exhorted Timothy to hang on to the faith, after seeing several of his associates who had "shipwrecked" their own faith (1 Timothy 1:19-20). The salvation-skewed faith is an incomplete faith. It cannot stand on the merits of one decision for faith. It must be accompanied by a life of discipleship in faith. I have seen people who believed initially and then gave up halfway. Shocking but true. It is not easy to take Path #1, the narrow gate / narrow way option. Jesus says that "only a few find it" which makes it a scary thought. I think about churches where there are literally very low barriers to entry, not much spiritual disciplines, and an extreme tolerance of sinful behaviour. All kinds of people are welcomed and become members. Yet, not everyone of them become gospel-centered disciples. This implies that if few find Path #1, many would be finding and traveling along all the other paths! People walking Path #1 will stand up for truth even under very hostile environments. They will not sign a deal if they know it dishonours the Name of Christ. They will remain faithful to their own promises even when their partners, their friends, or their loved ones betray them. They will take on the road less traveled because it is the right thing to do. They know who they are honouring and they will make sure that whatever they do, they do not live for themselves. They live for a bigger cause. More importantly, they live for the One who loved them, saved them, and gave them everything. Let me close with a story told by a North Korean witness at a jail. In North Korea, people are expected to give their allegiance to who they all called the "Great One." In the 90s, it was Kim II Sung. A group of North Korean Christians refused to bow down to this human leader. Instead, they pledged their allegiance to Jesus and were willing to suffer all kinds of torment and physical abuse. One evening on February 1992, eight prisoners were forced to carry a big kettle containing hot molten iron. (Melting temperature of iron is 1538 degrees Celsius). After calling out all the prisoners, the prison officers ordered the eight Christians to declare that: "... there is nothing in heaven to believe in; there is no God." There were no confession, only silence. What infuriated the prison officer was that the eight obeyed almost everything, except denying their faith. Finally, the prison officer could take it no longer and ordered the molten iron to be poured on the eight prisoners alive. Many people shrieked and screamed with horror as they saw the eight Christians shrivel and disintegrate alive. Lee, an atheist was so shocked that after she was released from prison several years later, she herself came to believe in Jesus. All because of the testimonies of these eight courageous believers who all had something to die for. Lee discovered that it is more than something. It is a Person. My friends, believing in Jesus is like choosing to enter the narrow gate. That is not the end of the story. It is only the beginning of a journey of faith. True believers will not only enter the narrow gate. They will soldier on along the narrow way. The narrow way of truth, of righteousness, of hope, of love, and of Christlikeness. A "Salvation-Skewed" faith may enter by the narrow gate but still choose to travel the wide path. Choose and live wisely.